With the transition into spring comes lots of options for going on a Toadstool Forest Bathing Walk. With warming temps and plentiful rain, there is so much in motion in our local forested areas. Join me in slowing down to experience the buds, the birds and the unfurling prehistoric greenery during this miraculous time of new and reawakening life. I have three walks coming up this week on Thursday April 5th, Saturday April 7th and Sunday April 8th. at Moose Hill in Sharon, Massachusetts! Discover Mass Audubon’s oldest wildlife sanctuary in a whole new way on this slow-paced guided therapeutic combination of leisurely walking, sitting, and observation. through a series of gentle sensory-opening invitations that welcome us to deepen our connection with nature. Interested in a Private or Individual Walk? Share Toadstool Walks April Newsletter with your friends, family, coworkers, team, students and teachers. We invite you to join us for Forest Bathing Day, when Forest Therapy Guides worldwide lead a connected walk experience for all people. This day emphasizes connection with the Earth and other nature enthusiasts, no matter the distance between us. I clicked off my headlamp and sat against a familiar smoke tree, sipping coffee from my travel mug. It was cold enough to see my breath. I wondered if I had packed enough supplies to spend this entire day outside. I collected some leaves and arranged them in a small circle, creating a threshold to mark the spot for where I would step in, crossing into the spirit world.I would travel by foot throughout the day, actively avoiding encounters with other humans. Tuning into my natural surroundings, I would allow my senses to guide me based on whatever information and signals they picked up. I would not keep track of time, and my phone would remain off in my backpack. I would follow the direction of the red-tailed hawk in flight and take note of pointing leaves. I would talk with and listen to trees, and respond to the gifts I’d receive along the way. I’d reciprocate their gifts in the ways I wrote about here. I would fast with the intention to keep my mind and body clear and open while in the spirit world. This ancient practice of leaving our daily routine and setting off for a day of unplanned meandering has been practiced by most cultures throughout history. I took my last sip of coffee just as the sky was beginning to brighten. It was time to begin. As I prepared to cross my threshold, I thought of my fellow Forest Therapy Guide Trainee, Everett. He too would be crossing into the spirit world any moment now. Even though he would be roughly five hundred miles south of where I would be, I felt comfort in knowing that he too would be moving across the land on his own Medicine Walk. When Tam suggested that we plan our Medicine Walks for the same day, the idea immediately resonated with me. Even though the walks are solitary experiences, I felt the same way that Tam did. Just the idea of sharing the journey with someone felt comforting. I knew we were separated by a great distance, but as I crossed my threshold at sunrise, I didn’t feel alone. I knew that Tam was thinking of me, just as I was thinking of her.During the day, however, I experienced something that went beyond just the comfort of knowing – intellectually – that I wasn’t the only person out wandering through the woods on a walk in the spirit world. There were moments when my energy began to wane or when my attention to being present on the land faltered. In those moments, there was always something that came to my aid. Once, it was a pristine hawk feather lying on my path, almost as if it had been placed there on purpose. Another time, it was a rising breeze that made the trees around me dance. And on several occasions, I believe it was a mental “push” that I got from thinking about Tam. I don’t know for certain the mechanism that created those bursts of energy or focus, but I do know that Tam’s presence was there, and that I was thankful for it. When we returned to our thresholds at sunset, we reflected on our experiences on the land and our thoughts of each other. As planned, we texted that evening just to let each other know that we had returned safely from the spirit world. Later on, when we were able to have a phone call and share a bit about our Medicine Walks, we both acknowledged moments where we became aware of each other’s presence on the land. Whatever the explanation, this experience had a profound impact on us. There is no question that our individual time spent on the land during our Medicine Walks was, for both of us, a transformational experience. We each carried an intention with us as we crossed our thresholds to begin the walk, and during the cycle of wandering and sitting that we repeated from sunrise to sunset, we had direct experience with all sorts of beings. Trees, birds, animals, plants, rocks, wind, and everything else that we physically encountered all served as signs which helped to tell us a story. Interspersed through those immediate and visible signs was something else, something intangible yet impactful. It was the moments when we felt connected to each other across hundreds of miles, and the contribution that those moments made to the story of our walks. How did those connections from afar happen? Humans are still making progress in revealing these mysteries. Each day, scientists uncover new explanations for phenomena that had previously been mysterious. There are stories about mothers having visceral reactions from afar when their children were in trouble. There are stories of twins aligning with each other’s thoughts and feelings. There are those moments in life when we are thinking about someone and we reach for our phone to call them, only to discover that our phone is ringing as they call us. As fields like quantum physics, neuroscience, and psychology converge, we learn more about these phenomena and how they relate to our functioning as human beings and our relationships with one another – even when separated by great distances. And what of the other beings that inhabit the more-than-human world? What part do they play in the mysterious realm of quantum dynamics? We may not fully know (yet! ), but through the work of people like Peter Wohlleben, author of The Hidden Life of Trees, we are also increasing our knowledge of the most ancient living beings on the planet. We are still discovering the nature of the interactions that exist between these ancient beings and examining their sentience with new eyes. Their lives, experiences, and personalities unfold on a scale of time that is far different from our own, but which can all be felt when we open ourselves to a relationship with them. They also have shown the ability to communicate across great distances; perhaps we will discover one day that their connections are not only made through physical means. While Radin’s observation and Wohlleben’s work may have not yet been proven beyond a shadow of a doubt, they provide an interesting context for reflecting on how we are all interconnected, and the idea that distance might not be the barrier that many think it to be. It certainly describes many experiences we have with friends and family who are far away; with the beings we encounter in the more-than-human world, and the energy they give us even when we are not in their immediate presence; and with the incredible day of discovery that we shared wandering the forests on our Medicine Walks. We, Tam and Everett, are now part of an international community of Forest Therapy Guides all trained through The Association of Nature Therapy Guides and Programs. There are hundreds of us, and collectively we are guiding Forest Therapy Walks year round. Sometimes multiple walks happen on the same day and even at the same time. Across the globe we are sharing the medicine of the forest with those who seek it, and with each other. We also foster partnerships with various land managers and organizations. When we consider the many layers of far-reaching connections that are happening, we are moved by the amount of healing that is being made possible for humans, trees, waters, and all the beings of the natural world. This motivates us to work towards further strengthening our interconnectedness. Join us for a day when distance dissolves, when we connect with our fellow guides in an intentional, connected walk experience. Imagine the medicines that we may uncover! Tam Willey and Everett Marshall are ANFT Certified Forest Therapy Guides. They trained in Massachusetts in 2017 and recently completed their practicum in January 2018. They created this Forest Bathing Day as a collaborative Harvest Project inspired by their tandem Medicine Walks. We tend to look at nature as a collection of things: plants and trees and fungi appear as objects that can only be acted upon, rather than engaged with. But what happens when we look at them as living beings with teachings to impart to us? 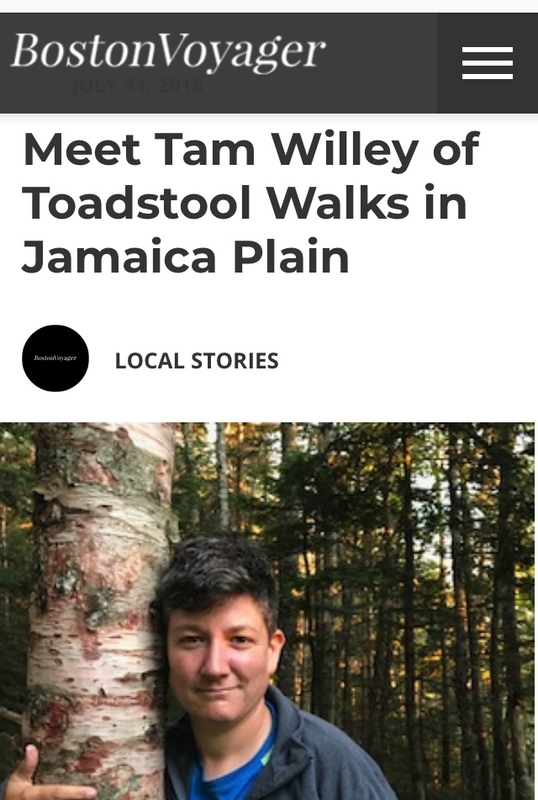 In this week’s article, guest writer Tam Willey explains how opening one’s self to a reciprocal relationship with nature can help us grow – and heal. I’ll refer to this tree by the name ‘Ash,’ and I will use ‘they,’ ‘them,’ and ‘their’ pronouns for Ash since we don’t have an animate word for “it” in the English language. Using inclusive language helps me pay closer attention. My path towards creating an ongoing practice of land reciprocity started in a human-centric world exploring race, class, gender, privilege, and the various -isms and phobias that perpetuate views of superiority and inferiority. As I continue to unpack my Western conditioning as a white American of Eastern and Western European descent, I find myself peeling back the layers of human dominance. By referring to Ash as ‘it,’ I fail to acknowledge that Ash is a living, breathing, animate being. Respectfully, I began to introduce myself to Ash in my own quiet way without spoken language. I acknowledged Ash’s place in the forest and looked around, taking in the mushrooms and leaves and dry stream bed nearby. I reached my hand out and explored the woven textures of Ash’s bark, following the pattern with my gaze up into the impossibly high canopy, ablaze in sunlight. I then looked down and wondered how deep Ash’s roots went below the surface. Were they as deep as Ash was tall? Was Ash photosynthesizing right in front of my very eyes? My thought web led me back up into my thinking brain. As if waking up from a dream, I suddenly remembered where I was. A wave of insecurity washed over me and I found myself asking the question, “Am I doing this right?” I looked around and noticed my fellow Forest Therapy Guide Trainees all engaging with their trees in their own way. I shook my head, laughing at myself and remembering that there is no exact science to how to converse with a tree. However, there is a load of research about what happens to our brains and bodies when we spend time being open with trees. From increased cerebral blood flow to stronger immune defenses, there is plenty of evidence demonstrating how relaxing in nature supports human health. I stepped back from Ash looking up and down and around, wondering what I could possibly offer and if it would be good enough. I leaned in and exhaled purposefully into the weave of Ash’s bark, offering a few dozen concentrated blasts of my carbon dioxide. I felt my heart rate slow and thanked Ash in my own way until the sound of a crow call told me it was time to say goodbye. In an industrialized civilization where consuming is in and conserving is out, living in gratitude and holding ourselves accountable requires hyper-vigilance. Reciprocity is a path towards healing and an effective coping mechanism in treating stress-related illnesses that result from living in a rapid, industrialized environment. It can be as simple as picking up a piece of trash. It can be leaving some kind of offering of natural material from your own body or from the forest floor as a way to honor or acknowledge a tree or a place. It can be creating a small structure, like a fairy house or an altar. It can be a form of activism or a regular monetary donation. It can also be a random act that isn’t explainable in words. When we practice reciprocity, we can face our human experience with fewer symptoms of stress, anxiety, boredom, self-hatred, rage, and crisis. We are less likely to cause harm. We are less likely to internalize feelings of inferiority, and less likely to act under the illusion of superiority. 5AM seems to be my rising time lately. As my brain and heart are so full, I feel the urgency to rise and start my day before I can fully open my eyes. Yesterday was the winter solstice and I watched the sunrise on top of Bussey Hill in the Arnold Arboretum with a new/old soul whom I met in November. It was one of those feelings you get when you meet someone and you are pretty sure you have known them for lifetimes and there is almost an instant ease. We connected over white pine tea and Tarot and discovered that we both tend the same land and foster relationships to the local trees and natural areas. We realized that we have practically been walking in circles around each other in our favorite meandering spots in the Arboretum talking to Eastern Hemlock, Norway Spruce, and the wide variety of conifers that live right here in our community. She invited me to join her in welcoming back the light by watching the sunrise and introducing me to meet a Birch Tree that she has been hangin with. I was delighted. She invited another friend too that I know from around town and the three of us met on top of the hill. The sky was clear as the golden sun came up and out came all the little last minute ritual items from everyone’s pockets. We did some formal letting go and bringing in in our own way. We wrote things, burned things, infused things, drank things, said things and did our nature connection thing in our own ways that we do and talked about our various inspirations and practices. It was very cold but we were filled with light until our extremities were too numb to linger and we ceremoniously descended the hill and went our own ways. Later that day I went to a birthday/solstice party for someone who was turning 91 whom I met on my first Forest Bathing Practicum Walk this past September. She tromped around with me and nine others on a full three hour long walk on a cool misty morning. She brought and offered so much life and wisdom and soaked up the experience like a sponge. We’ve kept in touch ever since and now we share a small meditation circle. At her birthday/solstice party, I met some other friends of hers. One of whom I learned went to the same elementary school as her in Holland in the 30’s. She shared with me that she had survived the Holocaust and had been through the camps and lost her family. This was the first time that I have met a Holocaust Survivor. I thanked her for sharing this information with me. She was very open about her story, saying that she makes a big effort to educate kids in school about what she went through. I acknowledged the importance of that. Meeting this woman yesterday on the winter solstice was timely and profound in many personal ways. And I know this was just the beginning of another new relationship. Last year at this time I was putting out some heavy intentions. There had been a build-up of pressure inside myself that brought an urgency to pursue some things that scared me. I then learned that astrologically I was right on time in making a big change in my life and that I am in the midst of my “midlife transits.” So I have been harnessing this momentum towards deeper connection and leaning into the natural world while finding ways to hold space for others to do this too. This practice has sustained me through my own share of challenges and painful experiences this past year. But I don’t wish 2017 away. No. I have learned so much and gained new perspectives. I was able to cope with the pleasures and agonies that come with the human experience without adding too much extra drama or story lines to events that are traumatic in nature and need no embellishments. This willingness to face life on life’s terms with tenderness has enabled me to form deeper relationships with humans of all kind and with the more-than-human world. In essence, I feel like I have metaphorically crawled out from under a rock this year and as I step out of the shadows I will always love and appreciate the rock. As I welcome back the light, I am filled with gratitude for the companions of yesterday’s solstice. Did you know that spending time connecting with nature has been medically and scientifically proven to treat stress-related illnesses? From increased cerebral blood flow to stronger immune defenses, there is loads of research about what happens when we relax, unplug and open our senses to the natural world. Toadstool Walks is teaming up with The Venture Out Project for a long weekend of Relaxation, Restoration, Rejuvenation, Reconnection on 40 acres of land not far from the Columbia River Gorge in Washington. This is for folks looking for some downtime in a Natural setting in Queer Community. Whether you love the outdoors and are looking for a different way to engage with nature or are simply looking to unwind and connect. There will be a series of structured daily offerings to support deepening our relationship with nature, each other and with ourselves. All offerings are optional. This is a time to recharge and recollect whether that means unplugging for a bit, sleeping, relaxing in the hot tub, journaling, storytelling, or just being, this retreat is intended to hold space for that. hiking, hot tub soaking, evening storytelling, morning sun salutations, journaling, downtime, etc. All you have to bring is you, exactly how you are. Sign up before February 1st, 2018 and save $50! Thats $375 if you sign up before February 1st, 2018. $425 after that. When is the last time you took a long leisurely walk in a natural setting? Or sat under a tree and observed the many stories playing out in nature? Have you ever considered that when you touch a tree, perhaps this tree is simultaneously touching you? As humans industrialize at lightning speed, we have become more and more disconnected from the natural world – to the point where the term “tree hugger” is a derogatory put down. Living in our urban, modern, industrialized civilization can be stressful. The cacophony of our phones, cars, computers, planes, trucks, barking dogs, crying babies, construction vehicles, machinery, yelling, and sirens can wreak havoc on our nervous systems. When we are stressed on a regular basis, we increase our risk for stress-related illnesses such as high blood pressure, headaches, exhaustion, anxiety, depression, moodiness and other mental impairments. Walking leisurely and sitting under trees not only helps us unplug and catch our breath, but it has also been medically proven to treat stress-related illnesses. I first learned about Forest Bathing/Shinrin-yoku on a day-long outdoor retreat I had signed up for through a local meditation center in Boston. I had no idea what to expect. We walked into the forest slower than I had ever walked and as we were guided through a series of gentle sensory opening prompts, I found my awareness expanding in profound ways. Even though I had previously spent extensive time outside, I had never experienced such the gamut of emotion and immersion within 15 minutes of entering a forest. I have sought plenty of refuge in the mountains and forests on many a hiking, camping, canoeing, and cross-country ski adventure. While it was apparent that these adventures would leave me feeling clear-headed, chilled out, restored, empowered, and strong, I hadn’t before had this context for what was happening to me physiologically from spending extended time in the woods. I began familiarizing myself with the science and research studies describing the many health benefits of connecting with nature. I came to understand that the healthfulness of what I was experiencing had less to do with the number of miles I could hike in a day or the views on top of a rugged mountain. My restorative healing and sense of well-being was a product of deep intentional reconnection with nature in a reciprocal way. I come from a lineage of railroad and factory workers. I see the effects of industrialized civilization on my family, friends, and community in various forms of stress-related illnesses, diseases and oppressions passed down from generation to generation. It is my intention to do what I can on my micro level to work towards breaking these cycles and bringing awareness to how we can heal ourselves, the earth, and support the wellbeing of all beings. I am committed to deepening my own practice of nature and forest therapy so that I can share it with whomever wants it. I am trained through the Association Of Nature and Forest Therapy Guides & Programs. This training both supports my growing nature connection and teaches me how to guide professionally. I am doing the bulk of my practicum work at the Arnold Arboretum. It involves a lot of observation, sketching, mapping, sitting and meandering. It also includes guiding a series of Forest Bathing Walks in collaboration with the Arboretum’s Event Programming. These walks have been well received and attendance has been full. If you have been unable to sign up for a fall walk I encourage you to sign up for one of my spring walks that will begin in March. I have had folks on my walks who have never been to the Arboretum before as well as those who have been regular visitors for years but have never experienced the collections in this way. One study I read showed that Forest Bathing is effective even for those who strongly dislike nature and don’t want to be outside. Studies show that it still works even if one is resistant while doing it. I find this an inspiring concept to sit with as a guide. As I unpack my Western-conditioning and embrace my relationship with the more than human world, I find I am able to deepen my compassion, empathy and gratitude for not only my fellow humans but also for our waters, our trees, our animals, our bugs, my own self, and all the beings that I never really noticed or connected with before. My name is Tam, and if you feel so inclined, I invite you to hug trees with me. Did you know that spending time connecting with nature has been medically and scientifically proven to treat stress-related illnesses? Start experiencing the healing medicine of Shinrin-Yoku as we connect with Cone Bearing Trees. 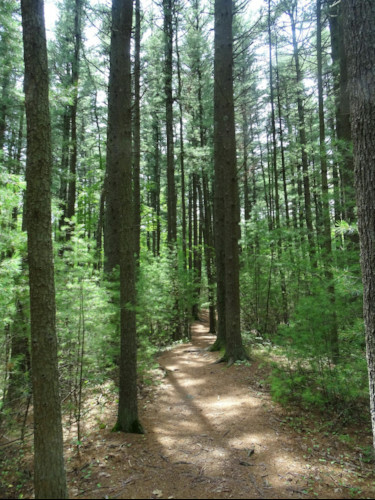 Slow down, unplug, relax, and soak in the fresh coniferous wonder on this Guided Forest Therapy Walk.